Taking a leap of sorts. 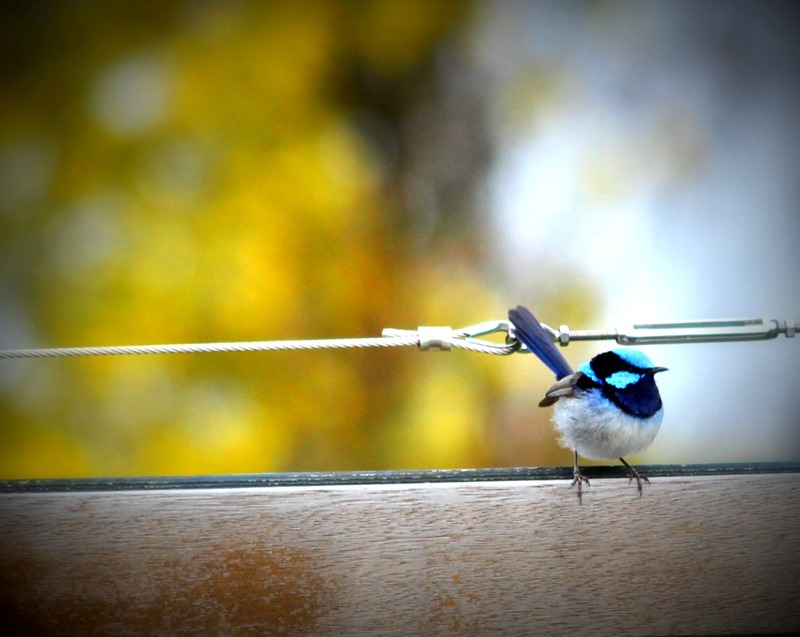 Beautiful Blue Wren I snapped in Daylesford, after this photo – he took a leap, back into the great unknown. Sometimes stability and a safety net isn’t all it’s cracked up to be if your not happy. Sometimes knowing at the end of the month you will have money and you will be able to pay your bills isn’t everything if your not happy. Granted, its what majority of us want and need but in my case this is not my everything right now, because I’m not happy.. I want to be happy everyday leading UP to pay day, not just on the day itself; I want to wake up every morning with a smile on my dial excited to be alive and happy to see the sunshine. Lately this isn’t happening, lately I find myself more often than not ready to burst into tears when my alarm goes off. Not exactly an idea situation. My job is just mundane and boring and I am not learning anything new anymore, nor am I giving anything back to society. I’m just a number in a line of people, a number I don’t want to be anymore. Thing is, I have been saying this for a while and I have been looking at other jobs and I even got offered a role the other week but it was for a lesser role in a smaller company with a drop in pay. Now, money isn’t everything but I am not stupid, I have said to myself that when I am moving on from this job, as hideous as I find it, it will be for a step up in the corporate ladder. Not sideways or down. So, instead of talking about it, and whinging about it and making myself more miserable, what I have been doing the past week is putting myself out there, I have been calling on all my contacts within the business and the companies we work with, I have been sticking my neck out, telling them what I’m interested in and telling them what I am good at etc etc (this may have included me putting ‘yoddling’ down as one of my point forms… eye catching yes?) . Because let’s face it, sitting there whinging isn’t going to get me anywhere fast. It’s time to take a leap. I’m not sure as yet what my ideal life job is, maybe I don’t have one, and maybe I am destined to roam and take a few jobs and learn some new skills and sway between here and Switzerland and just be a nomad. So, right now, although none of these jobs are my minds “ideal” jobs, they are good jobs and they are seemingly interesting, and while I’m still trying to figure out if there is an ideal job out there for me, I’m just going to go with the flow. Keep putting myself out there and applying and keep believing that I am doing what I am meant to be doing and to be content with that. J and I are going to be here for at least another year or so definitely so I really want to find a job that makes me shine and makes me feel like I am making a difference. One which doesn’t make me feel like I want to slam my face into my bed post every.single.morning when my alarm goes off. That’s fair, right ? So today I am calling on all those prayers, thoughts, angels, good vibe type wishes that my emu necking is going to get me somewhere and that I will get a job that can teach me some new things and maybe a few life lessons, coz’ i’ve got loads of room for those! Oh and maybe something that will pop a smile on my dial! This entry was posted in IBOT and tagged Blue Wren, Faith, Happiness, Job, Leap, Photography by Meagan. Bookmark the permalink. Hope your positive thinking and “yoddling” pays off! I’ve had a job that made me want to cry every morning when that alarm went off… I only wish I had a blog back then to release all of the feelings I was having regarding that job. I think blog-catharsis is a good thing – certainly not whinging! Sending all those good vibes your way. Mandie, Its funny how when you say it out load or blog about it, you really take it all in and know that its out there now, time to change it. That photo os absolutely amazing! I hope you find something that makes you sing!!! I hate jobs that make you miserable that you can’t grow in.. I found mine the day I resigned to be a full time mother. As the children get older, I need to go back but this time, to do something for me. what a beautiful photo – awesome, awesome awesome! I LOVE the fact that you put yodelling down as a strength! LOVE it! I took a leap of faith 5 years ago when we made our tree change. Both of us came here without jobs and the free fall was bloody scary for a while. But, if you’re a hard worker with good work ethics, you’ll land on your feet. Honestly. Oh lovely, massive hugs. You’ve taken a brave first step – acknowledging it! And yes, keep putting yourself out there. Someone once told me, even if you ARE happy in your job, you should always have your eyes and ears open for who knows what amazing opportunity may pop up when you aren’t even looking for it? Put it out there – to friends, family, contacts, the universe, and I wish you all the best. Will be sending lots of vibes and good thoughts from my end for you. Oh I really hope you get something! It’s so important to enjoy your job. Good luck – putting it out there is definitely the way forward and being open to any opportunities that arise (you never know which one will fit the bill) – and beautiful photo! !